Ear is a very prominent part of the face after nose and eyes especially in Indian subcontinent where in both the males and females it adorns a variety of ornaments to beautify the face. However, because of limited functional importance of external ear the burns of the ear are often neglected. More often, isolated burns of the ear are very rare. They are usually involved with facial burns and therefore inhalational injuries. 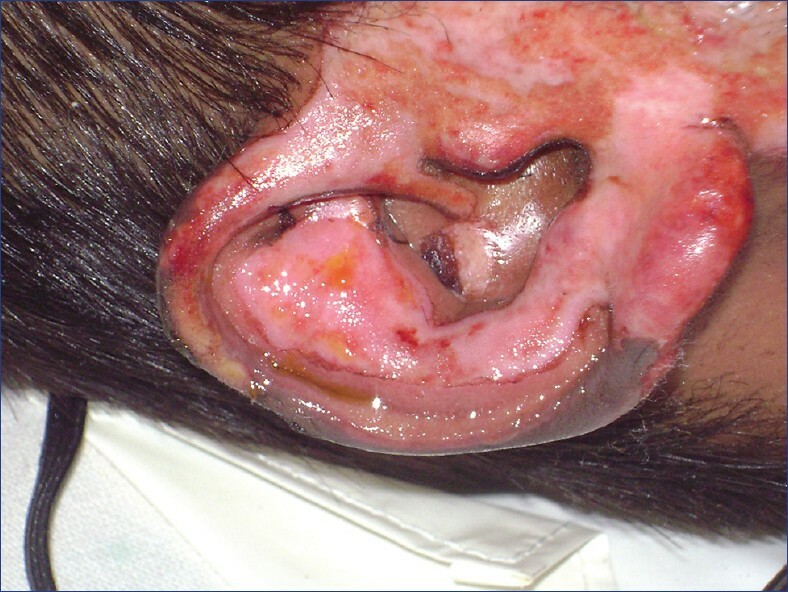 Overall management of burns to improve survival takes precedence over the management of just the burned ear. Therefore, neglected ear burns can lead to cosmetic deformity which can vary from minor to very severe. Giving due importance to this small structure can prevent a lot of morbidity during the acute phase and deformities later on as a sequel of burns. Correction of those deformities and giving a normal shape to the ear can be a very daunting task because of the intricacies involved in framing the cartilage and inadequate soft tissue availability in the surrounding area. This article emphasizes on the steps which can be taken from the first postburn day to avoid complications like chondritis, chondral abscess, and various other deformities because in a patient surviving burn injury, the quality of his or her life will be determined by the degree of these deformities. Ear can get involved by direct burns or due to chondritis. Aggressive treatment is required to prevent deformities and complications which can range from minor scarring to near total loss of pinna. 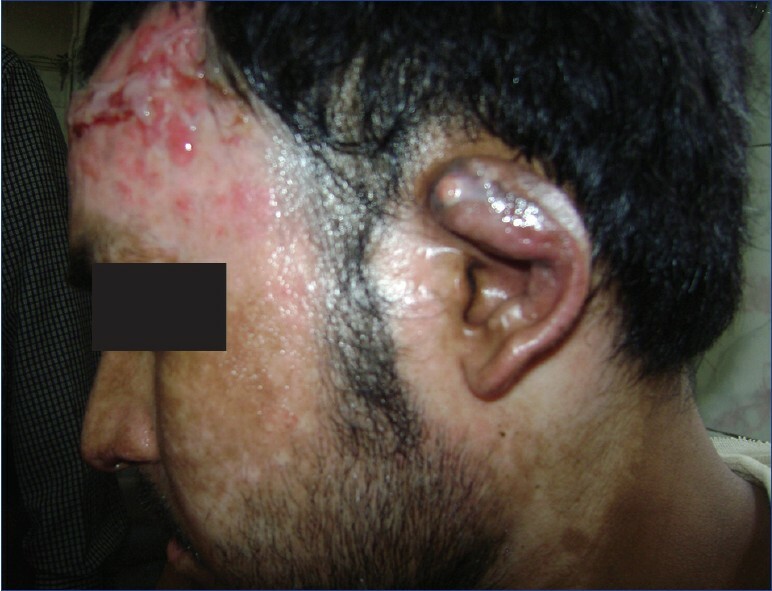 A burned ear may be characterized by the following features: (1) Scarring at the site of and surrounding the ear, (2) Loss of different components of ear framework helix/antihelix/lobule, (3) Total loss of ear leading to different deformities. In the face of these deformities and limitations, the surgical goals of reconstruction vary and can be very challenging. The peculiarity of the ear cartilage is that it is very thin and is covered on its anterolateral aspect by an equally thin layer of subcutaneous tissue and skin which is tightly adherent to the perichondrium. This cartilage has no intrinsic blood supply and depends on diffusion from perichondrium which in turn depends on overlying skin for vascularity. [Figure 1], [Figure 2], [Figure 3]: In the case of partial thickness burns the covering skin gets burned and edematous thus getting separated from underlying cartilage. This interferes with the blood supply of the cartilage which then undergoes avascular necrosis. 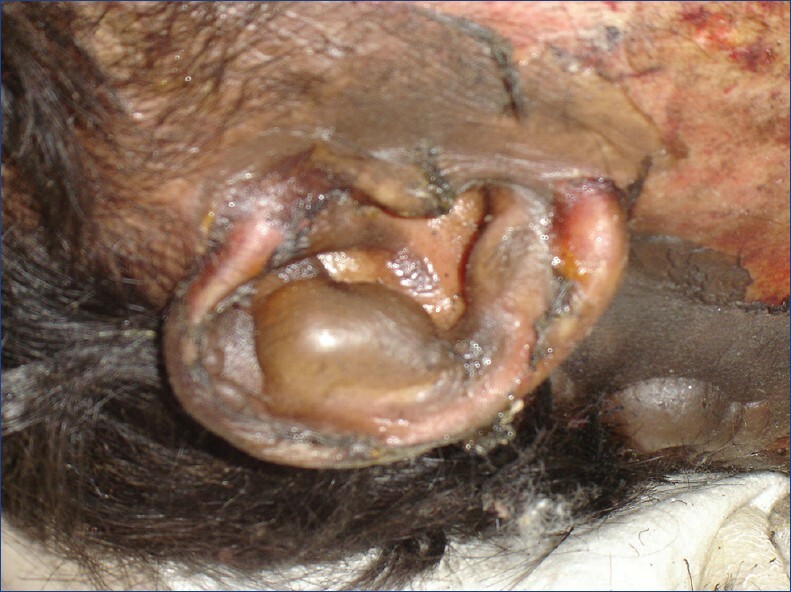 In full thickness burns of the ear, if the skin is completely charred it may expose the cartilage which eventually sloughs out due to exposure and infection. The loss of the supporting structure ultimately results in deformity of pinna  [Figure 4]. Chondritis or secondary infection of ear cartilage develops in the former, i.e., superficial and deep dermal burns and is seen 3-5 weeks postburn. In fact at times suppurative chondritis may occur even after reepithelialization has occurred [Figure 5]. It is not possible to predict which burned ear will develop chondritis. It is characterized by dull ear pain which rapidly increases in intensity, not relieved by analgesics. Ear becomes warm, erythematous, swollen and very tender and cepahaloconchal angle is increased [Figure 6]. This usually starts along the helix or antihelix and gradually involves entire ear and may eventually form an abscess. In 95% cases cultures yield Pseudomonas and Staphylococcus. Proper head positioning and timely intervention can prevent destructive chondritis of the ears. Goals of treatment : The goal for ear reconstruction is to restore aesthetic appearance of ear and maintain a superior sulcus which can accommodate glasses and to minimize complications from infection and fibrosis. Most of the burns heal without any operative intervention. The main goal or aim of treatment of acute ear burns is to prevent suppurative chondritis. "Chondritis of ear is better prevented than treated" - is a famous saying. The main consideration is to avoid pressure on burned pinna which cannot be overemphasized. Therefore the patient should not lie on either side and neither use a pillow under the head. Instead a 'donut' is used to keep the head elevated without the ears touching any surface. This prevents pressure necrosis of the ears and skin loss, thus preventing partial thickness burn from becoming a full thickness injury. There is no doubt that pressure on the burnt ear and further trauma of any kind has to be avoided to prevent further damage to an already compromised cartilage. The application of topical antibiotics like 1% silver sulphadiazene, sulfamylon, and 0.3% silver nitrate reduces contamination of the wound and allows partial thickness burns to heal. , However, the most effective topical agent for the ear which can prevent and even treat chondritis is mafenide (Sulfamylon) cream because of its excellent ability to penetrate the eschar and the cartilage and has a broad antibacterial spectrum with good bacteriostatic action. It has to be applied twice daily because of its active penetration. Like any superficial second degree burn anywhere else on the body, in the case of ear also biological dressings can be used as they promote epithelialization and reduce the chances of infection, chondritis and further ear damage. A contour dressing with minimal pressure during bandaging is also helpful [Figure 7]. Use of certain ingenuous splints instead of a contoured dressing has been reported in the literature ,, but there is no added advantage of a splint over a contoured dressing. In fact, it can be difficult to apply a splint for protection of ear in case the entire face is burned. Instead when a contoured dressing is given, it helps in reducing edema and thereby reducing the chances of chondritis. An occlusive dressing also reduces the chances of nosocomial infection. With this local care the swelling subsides and partial thickness burns heal with time. In case skin is lost but perichondrium is preserved, it will 'take' a thin skin graft or else granulation and epithelialization can occur. If cartilage is exposed in a small area, it can be debrided and skin graft applied over its cut end. In full thickness burns if the cartilage is not exposed some authors suggest leaving the eschar to separate spontaneously as it acts as a biological cover for underlying cartilage preventing it from desiccation and applying split skin graft over the underlying granulation tissue later. , However if the eschar is suppurative it should be debrided. Others suggest early excision of skin and if a large area of cartilage gets exposed, the ear cartilage can be salvaged soon after burns using a vascularized flap. Since local skin is commonly injured, regional or distant flaps have been described to cover the cartilage. , These include platysma myocutaneous flap, temporoparietal fascial flap, the latter being the best choice because of its thinness and pliability. Though one must remember that temporoparietal fascia is the best option for secondary ear reconstruction so it should be used judiciously if at all in the acute stage. Postauricular fascia can also be used as a turn over flap to provide cover. Rosenthal  described 12 zones of partially burned ear which were divided into three major regions which include 6 zones which are used as donor sites for advancement flap, three zones which can be excised and closed primarily and two zones which should be preserved as far as possible. Simple drainage of pus is insufficient as chances of recurrence is high. , Cultures of pus drained may often be sterile. Therefore excision of all underlying necrotic cartilage leaving skin intact after a bivalving incision in the ear which splits ear into anterior and posterior surfaces has been recommended by most authors. , This prevents recurrence. The involved cartilage is soft and yellow and lacks resilience of normal hyaline cartilage. All the soft cartilage must be removed, leaving behind only cartilage of normal consistency. Gauze soaked in antibacterial solution is packed between the skin flaps which reduces further progression of infection and a light dressings is given over the ear. Dressing is to be changed after 24 hours and any residual necrotic cartilage should also be excised [Figure 8], [Figure 9]. Dressing is continued till secondary closure is achieved. Topical chemotherapy has a better influence on outcome of chondritis as systemic antibiotics are ineffective since cartilage survives by diffusion from perichondrium. Ear reconstruction should be undertaken once all the burns have healed and deformity has established. Functional reconstruction of important areas like eyelids, hand, axilla and elbow takes priority over the ear however since ear reconstruction is a staged procedure; it can be started simultaneously when other areas are operated upon. Moderate - concha is normal, upper half of ear has sloughed out with loss of antihelix with its anterior and posterior crura. Severe - only a remnant of concha, marked scarring of local soft tissue, external meatus normal or stenosed. Group I: In this group the postauricular skin is normal and is used to provide cover to the cartilage framework. Group II: In these patients the postauricular skin is either scarred or grafted but is soft and supple and can be therefore used for cover. Group III: In these patients local skin is not available for draping the cartilage so temporoparietal fascia is used for covering cartilage as an axial or random flap. Group IV: In these patients local and regional skin as well as fascia is not available for cover. A free temporoparietal fascial flap from contralateral side or free radial forearm fascial flap is indicated for them. Group V: These are the patients in whom reconstruction is not possible because of non availability of local and regional skin and anaesthesia problems. They are therefore advised to use an external prosthesis. Postburn scar contracture in ear is released and defect resurfaced by either split skin graft, full thickness graft, transposition flaps, rotation flaps and posterior auricular 'revolving door' island flap. Partial ear loss: It can involve different parts of the ear. In burns of the ear usually only the helix and lobule are lost but the central part of the ear is spared though it may be deformed by contracting scars. The spared conchal structures have therefore been used as transposition flap for reconstruction of deformed ear  [Figure 10]. In the case of localized defects of helix and scapha, superior and inferior chondrocutaneous helical rim flaps based on postauricular skin described by Antia and Buch  are used though it makes the ear smaller. In case only helical rim is lost, a thin tube can be raised from postauricular area if undamaged and transferred to form helix in stages. In case postauricular area is scarred, the tube formation from preauricular area or from cervical skin expanded flap or lower supraclavicular area is a good therapeutic option. Goldstein and Stevenson  suggested leaving these flaps open, allowing them to tube themselves thus reducing vascular compromise from light suturing. Flap for cartilage cover should be thin and pliable so as not to mask the convolutions of underlying cartilage framework. For this reason temporoparietal fascial flap offers the best option. The advantage of using temporoparietal fascial flap is that the scar is hidden in hair bearing area of scalp and if required hairy scalp can also be raised along with it. Covering carved cartilage with temporoparietal fascial flap was originally described by Tegmeier and Gooding in 1977 and popularized by Brent in 1980  and Brent and Byrd in 1983. Fascial flap may be used as an axial pattern flap which is based on posterior branch of superficial temporal artery and vein. In case it is unavailable, a random pattern fascial flap can be used. In 1978, Ohmori  used temporoparietal muscle flap to cover the conchal region of silicone ear implant whereas Cronin  used a fascial flap for the coverage of the same. In 1985, Brent et al. used temporoparietal fascial flap as free flap with scalp island flap for ear reconstruction and recreation of hairline and sideburns. If the temporo-auriculomastoid region is unfavorable, Mutaf et al. have successfully used a bilobed cervical flap for cover, if neck skin is unburned. It offers a simple, well vascularized, hairless skin with good color match, texture and thickness. Even medpore ear scaffold covered with superficial temporoparietal fascia flap gives a satisfactory one-stage reconstruction of total ear loss as medpore provides better biological compatibility compared to silastic implant. Wellisz  and Jones and Wellisz  used temporoparietal fascial flap with MEDPOR framework for reconstruction in burned ear with excellent results. Shanbagh et al. compared MEDPOR polyethylene implant with silicone implant in external ear reconstruction showing higher extrusion of silicone implants. Tissue expander can also be inserted in the pre- or postauricular skin if unscarred , and the expanded normal skin can be advanced to the auricular region to provide cover over a cartilage framework or implant. In case all of the above options are not available then contralateral temporoparietal fascial flap can be transferred by micro vascular technique to provide cover as reported by Brent and Byrd. In patients with bilateral devascularized temporoparietal region or in whom contralateral fascial flap cannot be used, there are very limited options. In those cases use of expanded forearm skin flaps or forearm fascial flap has been reported. Akin  described the use of a prefabricated free radial forearm fasciocutaneous flap with an autogenous costal cartilage framework for total auricular reconstruction in burn patients. Drawback of using forearm flap is the donor site deformities, hair growth, and skin color mismatch and sacrifice of a major artery. Using radial forearm fascial free flap for ear reconstruction has the advantages of providing thin flap with long pedicle and preserving forearm skin. Distant-free flaps provide poor quality of skin cover which masks the convolutions. In selected cases, in which the patient is unwilling to undergo multiple surgical procedures and for patients with anesthetic problems prosthesis can be fixed to cranial bone by osseointegrated titanium screws. But the cost and potential long-term complications are deterrents to their regular use. For both the patient and the surgeon, realistic expectations are important to the success of any reconstruction. This is more important in the case of ear burns as many a times it may not be possible to fulfill the patients expectations and also because the entire process of ear reconstruction is a long process. Therefore, it is more important to take even the burns of the ears seriously and give it proper care, thus preventing complications and further deformities. 1. Mills DC, Roberts LW, Mason AD, McManus WF, Pruitt BA. Suppurative chondritis: Its incidence, prevention and treatment in burned patients. Plast Reconst Surg 1988;82:267. 2. Bhandari PS. Total ear reconstruction in post burn deformity. Burns 1998;24:661-70. 3. Goel TK, Law EJ, MacMillar BG. Management of acutely burned ear. Burns Incl Ther Inj 1983;9:218. 4. Bhandari PS. 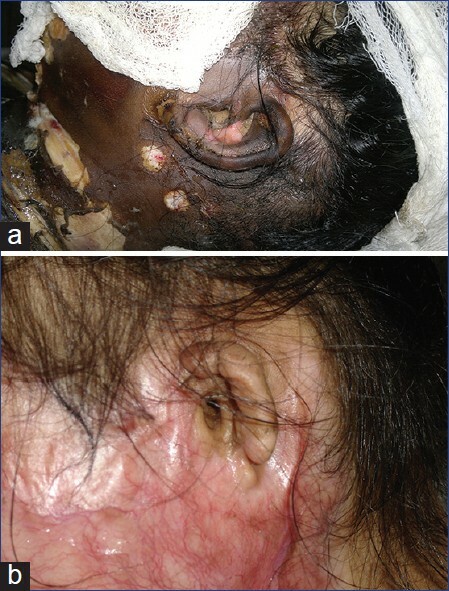 Facial burns in Principles and Practice of Burn care. In: Sarabahi S, Tiwari VK, Goel A, editors. Jaypee Publishers; 1 st ed. 2010. p. 345-61. 5. Grant DA, Finley ML, Coers CR. Early management of burned ear. Plast Reconstr Surg 1969;44:161. 6. Dowling JA, Foley FD, Moncreif JA. Chondritis in burned ear. Plast Reconstr Surg 1968;42:115. 7. Harries CA, Pegg SP. Foam ear protectors for burnt ears. J Burn Care Rehabil 1989;10:183-4. 8. Jordan MH, Gallagher JM, Allely RR, Leman CJ. A pressure prevention device for burned ears. J Burn Care Rehabil 1992;6:673-7. 9. Manigandan C, Dhanraj P. An innovative, cost effective pressure relieving device for buried ears. Burns 2004;30:269-71. 10. Rosenthal JS. The thermally injured ear: A systematic approach to reconstruction. Clin Plast Surg 1992;19:645. 11. Spira M, Hardy SB. Management of the injured ear. Am J Surg 1963;106:678. 12. 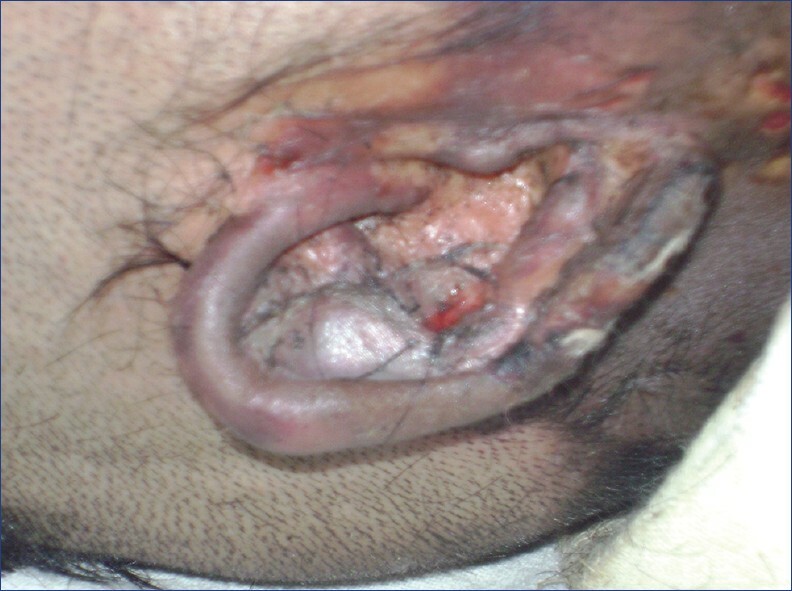 McGrath MH, Ariyan S. Immediate reconstruction of full thickness burn of an ear with an undelayed myocutaneous flap: Case report. Plast Reconstr Surg 1978;62:618. 13. Achauer BM, Witt PD, Lamb R. Salvage of ear cartilage in patients with acute full thickness burns. J Burn Care Rehabil 1991;12:339. 14. Wanamaker HH. Suppurative perichondritis of the auricle. Trans Am Acad Ophthalmol Otolaryngol 1972;76:1289. 15. Apfelberg DB, Waisbren BA, Masters FW, Robinson DW. Treatment of chondritis in the burned ear by local instillation of antibiotics. Plast Reconstr Surg 1974;53:179-85. 16. Greminger RF, Elliott RA, Rapperport A. Antibiotic iontophoresis for the management of burned ear chondritis. Plast Reconstr Surg 1980;66:356. 17. Lynch JB. Thermal burns. In: Grabb WC, Smith JW editors. Plastic Surgery. 2 nd ed. Boston: Little, Brown; 1973. p. 611-20. 18. Strond MH. The simple treatment for suppurative perichondritis. Laryngoscope 1963;73:556. 19. Strond MH. Treatment for suppurative perichondritis. Laryngoscope 1978;88:176. 20. Kung FH, Chu HY, Hao CJ. Experiences in the plastic repair of the burned ear. Plast Reconstr Surg 1966;85:168. 21. Brent B. The acquired auricular deformity: A systematic approach to its analysis and reconstruction. Plast Reconstr Surg 1977;59:475. 22. Feldman JJ. Reconstruction of burned face in children. In: Serafin D, Georgiade N, editors. Pediatric Plas Surg. St Louis, CV Mosby Company; 1984. p. 552. 23. Saraiya HA. A near closed book contracture of the ear: A case report. Burns 2000;26:490-2. 24. Donelan MB. Conchal transposition flap for postburn ear deformities. Plast Reconstr Surg 1989;83:641-54. 25. Antia NH, Buch VI. Chondrocutaneous advancement flap for the marginal defect of the ear. Plast Reconstr Surg 1967;39:472. 26. ZHANG Zhi-yuan, ZHAO Yan-yong, JIANG Hai-yue, ZHUANG Hong-xing, YANG Qing-hua, NIU Zhao-he, et al. Repairing auricle defect after burn using the cervical expanded flap to form skin tube. Chin J Aesthetic Med 2008-08. 27. Goldstein JA, Stevenson TR. 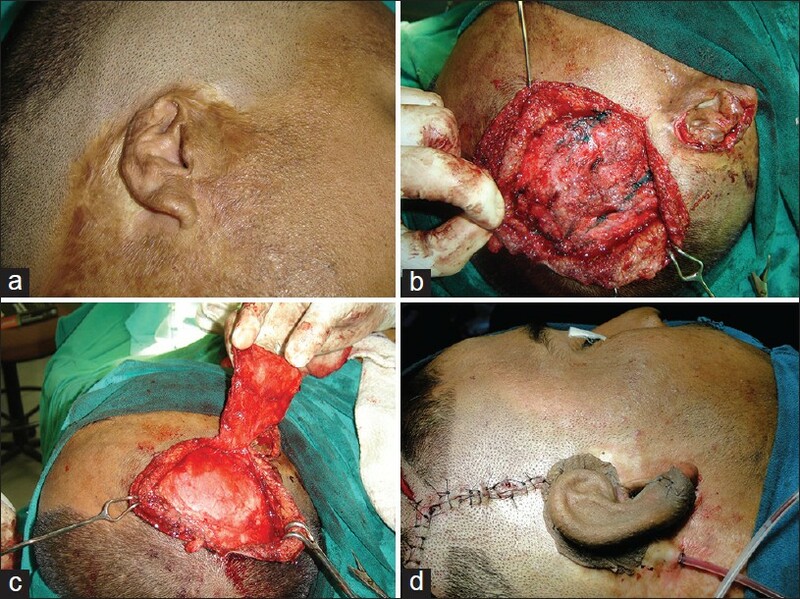 Reconstruction of ear helix: Use of self tubing pedicle flap. Ann Plast Surg 1988;21:149. 28. Davis J. Discussion of traumatic deformities of the auricle. In: Tanzer RC, Edgerton MT, editors. Symposium on reconstruction of auricle. St. Louis: CV Mosby Company; 1974. p. 246-7. 29. Cronin TD, Braver RO, Greenberg RL. Follow up study of silastic frame for reconstruction of external ear. Plast Reconstr Surg 1968;42:522. 30. Edgerton MT, Bacchetta CA. Principles in the use and salvage of implants in ear reconstruction. In: Tanzer RC, Edgerton MT, editors. Symposium on reconstruction of auricle. St Louis: Mosby; 1974. p. 587. 31. Fox JW, Edgerton MT. The fan flap: An adjunct to ear reconstruction. Plast Reconstr Surg 1976;58:663. 32. Brent B. The correction of microtia with autogenous cartilage grafts I: The classic deformity. Plast Reconstr Surg 1980;66:1. 33. Brent B, Byrd HS. Secondary ear reconstruction with cartilage grafts covered by axial, random and free flap of temporoparietal fascia. Plast Reconstr Surg 1983;72:141. 34. Ohmori S. Reconstruction of microtia using silastic frame. Clin Plast Surg 1978;5:379. 35. Cronin TD. Reconstruction of ear with a silastic framework and fascial flap. Presented at the Annual meeting of the California Plastic Surgery Society. Monterey, CA: March 9, 1979. 36. Mutaf M, Isik D, Atik B, Bulut O. Versatility of bilobed cervical skin flap for total ear reconstruction in the unfavourable temporo auriculomastoid region. Plast Reconstr Surg 2006;118;652-62. 37. Wu JM, Lin ZH, Jiang H, Yuan XB, Zhao YZ, Zhu XH, et al. One stage reconstruction of post burn whole auricle defect with medpore ear scaffold covered with superficial temporoparietal fascial flap. Zhonghua Shao Shang Za Zhi 2004;20;226-8. 38. Wellisz T. The reconstruction of burned external ear using a medpore porous polyethylene 'pivoting helix' framework. Plast Reconstr Surg 1993;91:811-8. 39. Jones C, Wellisz T. External ear reconstruction using a medpore porous polyethylene framework. AORN J 1994;59:411-22. 40. Shanbag A Friedman HI, Augustine J, Von Recum AF. Evaluation of porous polyethylene for external ear reconstruction. Ann Plast Surg 1990;24:32-9. 41. Nordstrom RE, Salo HP, Rintala AE. Auricle reconstruction with the help of tissue expansion. Fac Plast Surg 1988;5:338-46. 42. O'Neal RM, Rohrich RJ, Ienburg PH. Skin expansion as an adjunct to reconstruction of external ear. Br J Plast Surg 1984;37:517. 43. Chana JS, Grobbelaar AO, Gault DT. Tissue expansion as an adjunct to reconstruction of congenital and acquired auricle deformities. Br J Plast Surg 1997;50:456-62. 44. Akin S. Burned ear reconstruction using a prefabricated free radial forearm flap. J Reconstr Microsurg 2001;17:233. 45. Park C, Roh TS, Chi HS. Total ear reconstruction in the devascularized temporoparietal region II. Use of the omental free flap. Plast Reconstr Surg 2003;3:1391-7. 46. Signorini M, Rafanelli G, Pajardi G, Stefani A, Venini G. Ear prosthesis in burns of external ear. Technical notes. Ann Chir Plast Asthet 1995;40:265-70.